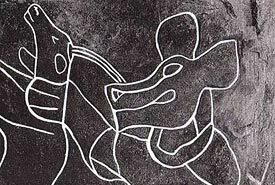 Among the oddest appearances in the Sahara Rock Art rank the hermaphroditic creatures, composed of man and beast. They are called theriomorphs (“beast-shaped”), though the term therioanthropics (“partly bestial and partly human in form”) would be more appropriate. In Axel and Anne-Michelle Van Albada they are called “hommes-chiens” (dog-shaped humans). Their appearance coincides with those of the cattle drawings which can’t be coincidental. They obviously must be linked to the cattle culture. Men bear animal heads (as mythical figures) or masks pulled over their heads, consisting of heads of hyenas, dogs, springboks, jackals, donkeys, rhinoceroses, antelopes, and others. It has to remain undecided whether it’s about hunters in the disguise of animals to further their good hunting, or if it’s more likely that we’re dealing with ghosts, demons, shamans or with medicine men. Also women bear masks, but extremely rarely. Often, masks are considered to be the seat of spiritual powers which the bearers of masks acquire when putting on the mask, while others are terrified. The relationship of man and beast occurs in all first cultures. Animals inhabit a higher, supernatural cosmos from where humans go and get the power for their earthly works by identifying themselves with it. In this sense, animals can be considered as guardian spirits. Rüdiger and Gabriele Lutz see these creatures as “a hunting god in control of animals”. Since we’re hardly in a position to understand the way of thinking of those people that lived 5000 and more years ago (and under circumstances which we also cannot really imagine), animal masks are open to all kinds of interpretation; but probably it’ll be best to hold on to the knowledge modern ethnology is starting from. Formally, hyena or dog people and people with hyena or dog masks have sharp teeth for biting. Other masks we compare, and if only for the sake of surprise, with comic figures which especially becomes clear in the outline. All naturalism is of the past. One cannot but admire these grandiose stylistic findings.